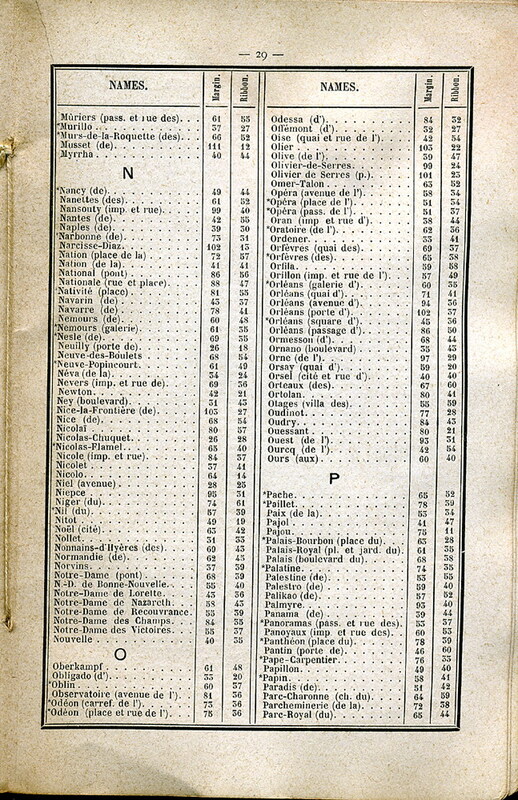 Publisher The Bon Marche by Imprimerie Lahure, 9 , rue de Fleures, a Paris. Relation Miller, Michael B.. 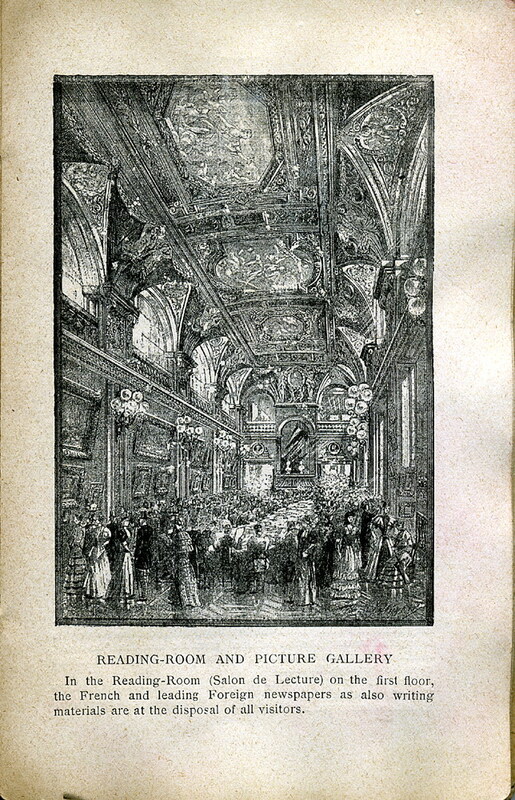 The Bon Marché : bourgeois culture and the department store, 1869-1920 / Michael B. Miller, Princeton, N.J.: Princeton University Press, 1981 ; Frank Coxe Collection, UNCA Special Collections ; E.M. Ball Photographic Collection, UNCA ; Documenting the American South, Chapel Hill: Asheville -- the Ideal Autumn and Winter Resort City: Electronic Edition. Washington: Southern Railway (U.S.) Passenger Traffic Dept., 1900?. Documenting the American South, UNC Chapel Hill: Autumn and Winter in the Land of the Sky: Electronic Edition. Washington: Southern Railway (U.S.) Passenger Traffic Dept., 1915? ; LeCompte Postcard Collection . Rights Any display, publication or public use must credit D. H. Ramsey Library, Special Collections, University of North Carolina at Asheville. Copyright retained by the authors of certain items in the collection, or their descendants, as stipulated by United States copyright law. 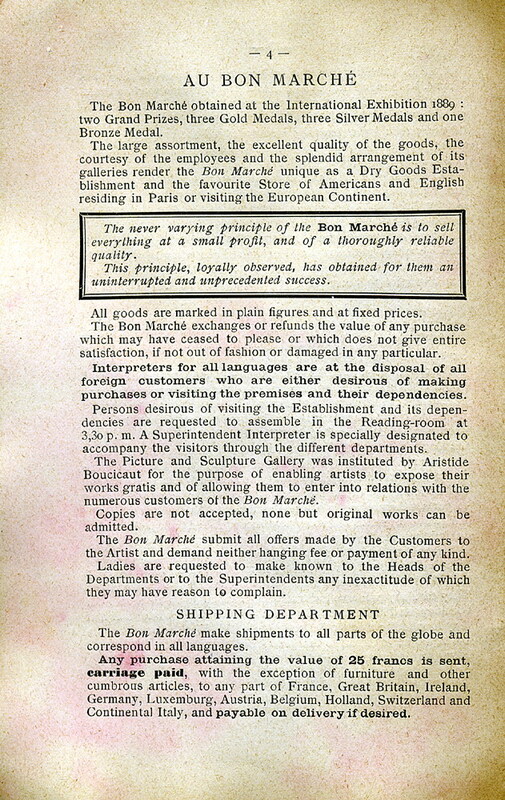 Description A 36 page promotional booklet for the Bon Marche department store in Paris, France used for reference in the creation of the Asheville, N.C., Bon Marche department store, created and owned by the Lipinsky family. 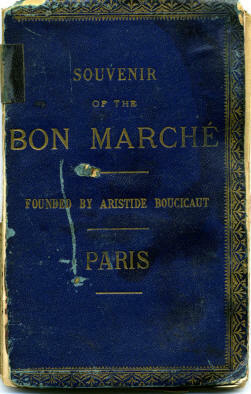 The elegant booklet contains a description of the Bon Marche administrative practice including personnel guidelines; a ribbon-map that can be used to estimate distance and to locate "instantly any street" and environs; and a comprehensive list of Paris, its streets, squares, etc..
Cover bonm00 [Cover] Souvenir of the Bon Marche, Founded by Aristide Boucicaut, Paris. 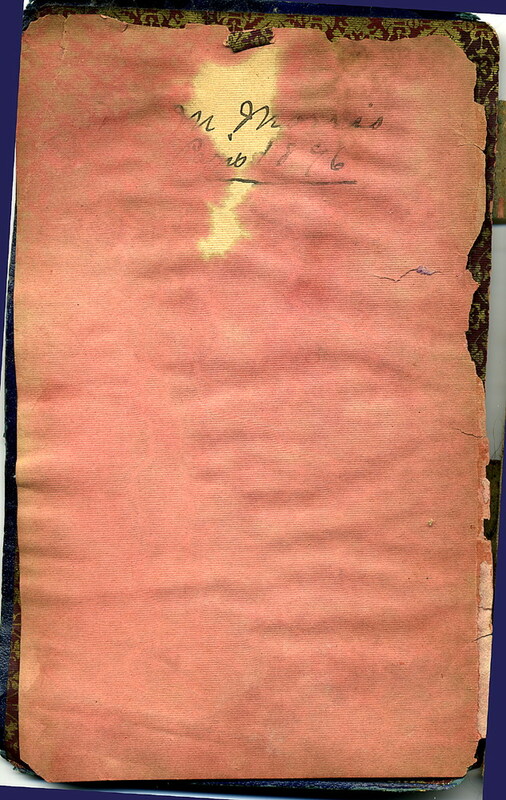 paper bonm00 [Back of endpaper with note: "M. Morris, Paris 1896"
In 1863 Aristide Boucicaut became sole proprietor of the Bon Marche, where he had entered 10 years previous as partner; at this time the House was of small importance, employing- only a limited number of assistants. 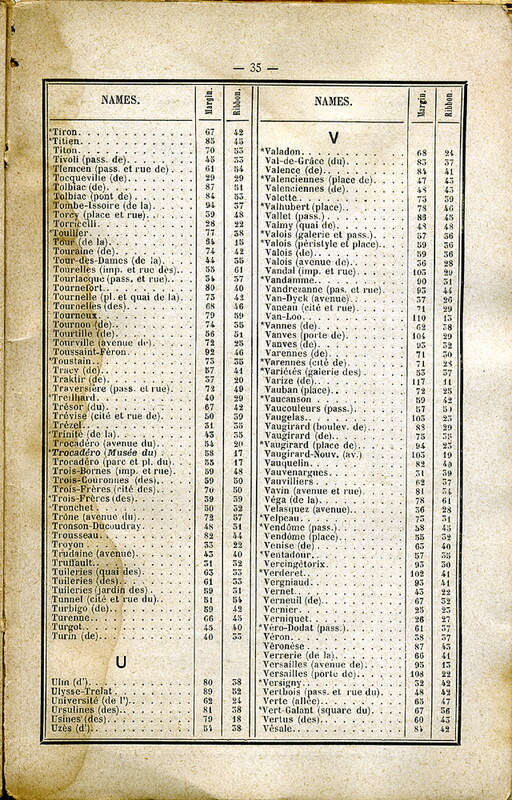 A succession of changes in the general arrangement of the premises, amelioration in the condition of the employees, and the constant practice of most scrupulous loyalty in business transactions, had attracted and secured custom, showing, even in the short space of 10 years, most important results. 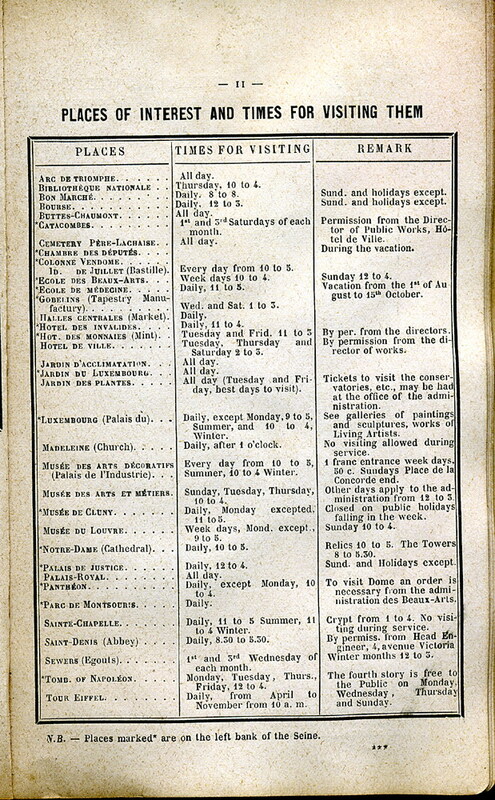 In 1869 the first stone was laid of the actual building; since that time a succession of aggrandisements, necessitated by the continual growth of the business, have transformed the Bon Marche"' and rendered it the most Unique Establishment in the World. 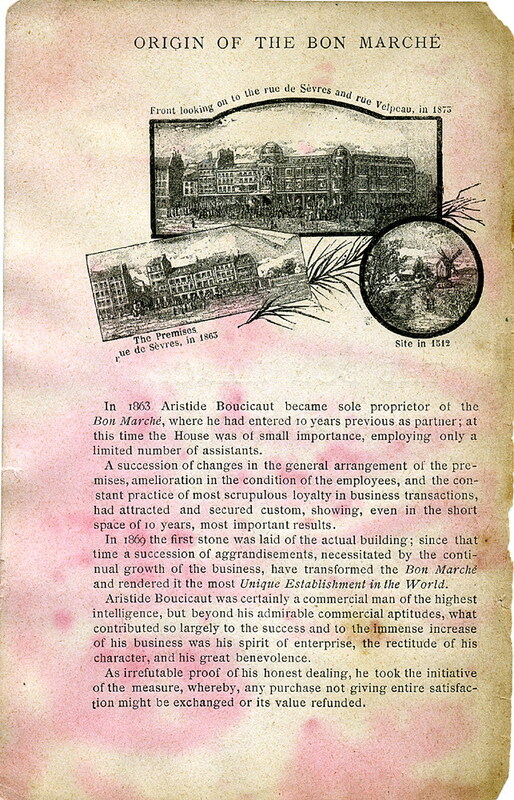 Aristide Boucicaut was certainly a commercial man of the highest intelligence, but beyond his admirable commercial aptitudes, what contributed so largely to the success and to the immense increase of his business was his spirit of enterprise, the rectitude of his character, and his great benevolence. As irrefutable proof of his honest dealing, he took the initiative of the measure, whereby, any purchase not giving entire satisfac­tion might be exchanged or its value refunded. Aristide Boucicaut not only founded a powerful Business House, he founded at the same time a great humane work, a social institution. He did not merely content himself with the realization of profit, he applied himself, above all, to merit the confidence of the public by universally acknowledged integrity, and by a perseverance and enterprise which in no way excluded all profitable innovations. 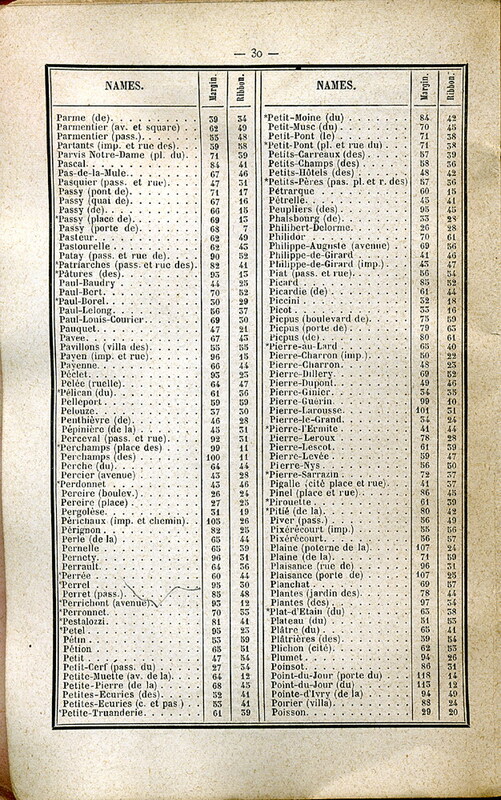 The system of selling everything at a small profit and of a per­fectly reliable quality, such was, in its simplicity, the rule traced out by Aristide Boucicaut and from which the Bon Marche has never deviated. He was supported by a superior staff of employees, chosen with care, governed paternally, and organized according to a just rule which accords advancement for service rendered and permits each one to aspire to the most important situations. An interest on all individual sales assures a fair division of salary. The Provident Fund founded by Aristide Boucicaut, the Reti­ring Pension Fund founded by Madame Boucicaut and the Relief and Pension Fund, allow all employees to await with confidence the days of old age. 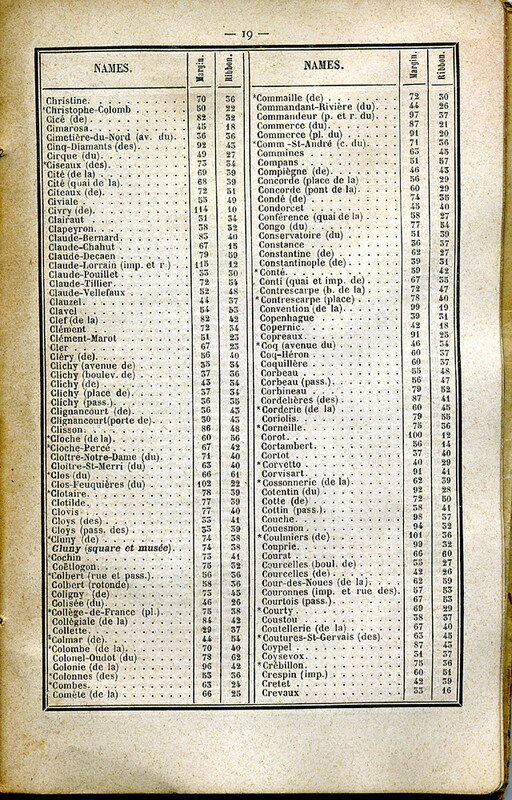 The constitution of the House, established by Madame Boucicaut in 1880, has allowed a great number of the employees to become purchasers of shares in the business. 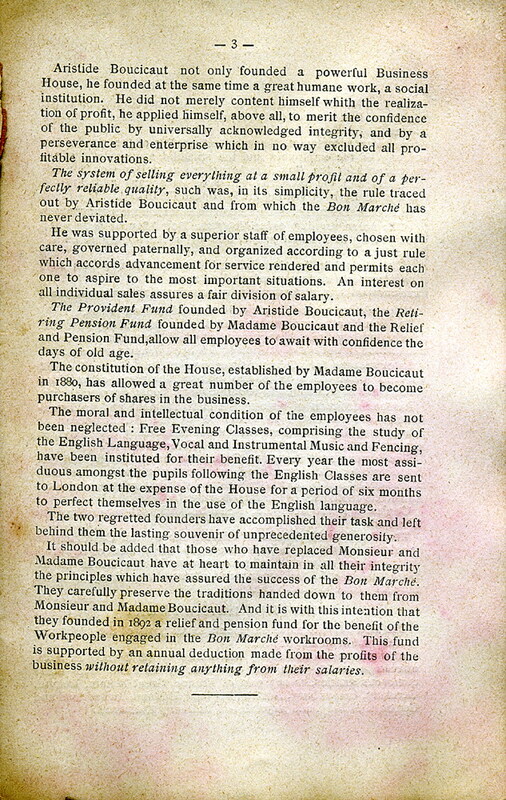 The moral and intellectual condition of the employees has not been neglected : Free Evening Classes, comprising the study of the English Language, Vocal and Instrumental Music and Fencing, have been instituted for their benefit. Every year the most assi­duous amongst the pupils following the English Classes are sent to London at the expense of the House for a period of six months to perfect themselves in the use of the English language. The two regretted founders have accomplished their task and left behind them the lasting souvenir of unprecedented generosity. It should be added that those who have replaced Monsieur and Madame Boucicaut have at heart to maintain in all their integrity the principles which have assured the success of the Bon Marche. They carefully preserve the traditions handed down to them from Monsieur and Madame Boucicaut. 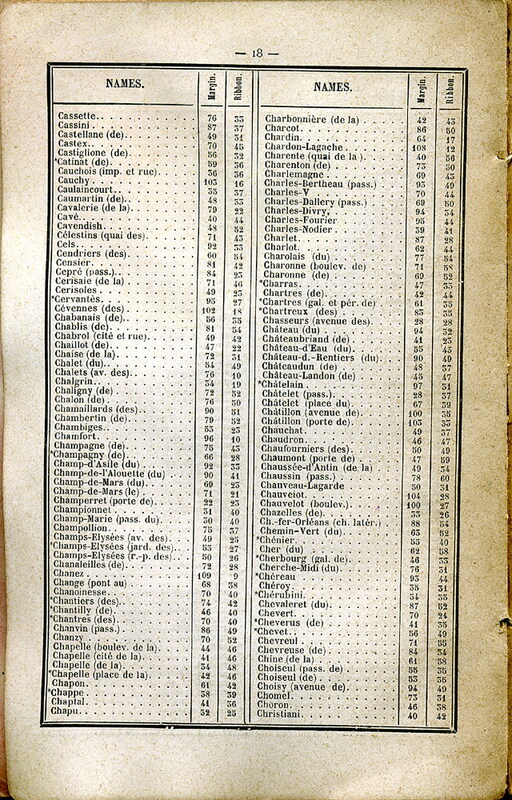 And it is with this intention that they founded in 1892 a relief and pension fund for the benefit of the Workpeople engaged in the Bon Marche workrooms. This fund is supported by an annual deduction made from the profits of the business without retaining anything from their salaries. 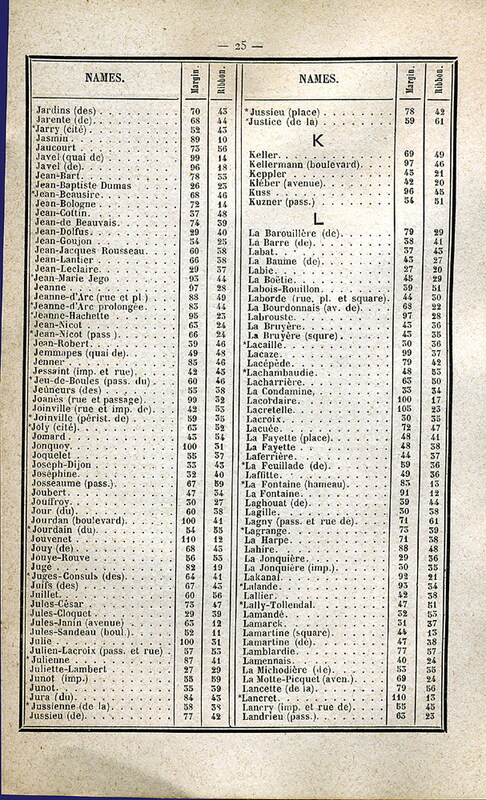 The Bon Marche obtained at the International Exhibition 1889 : two Grand Prizes, three Gold Medals, three Silver Medals and one Bronze Medal. 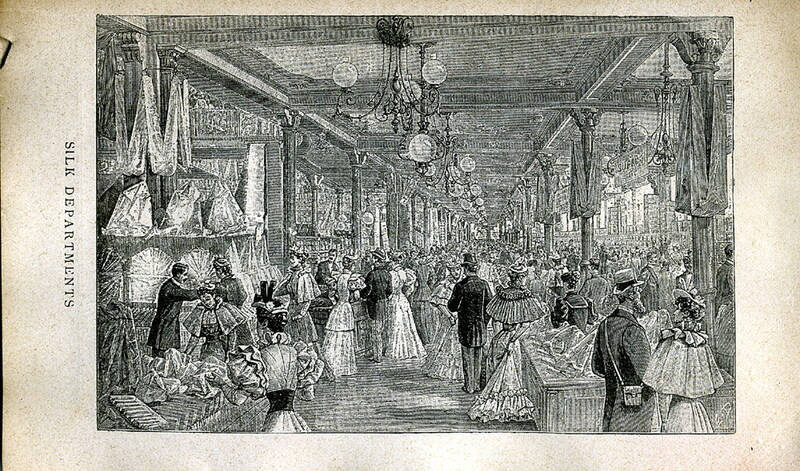 The large assortment, the excellent quality of the goods, the courtesy of the employees and the splendid arrangement of its galleries render the Bon Marche unique as a Dry Goods Esta­blishment and the favourite Store of Americans and English residing in Paris or visiting the European Continent. 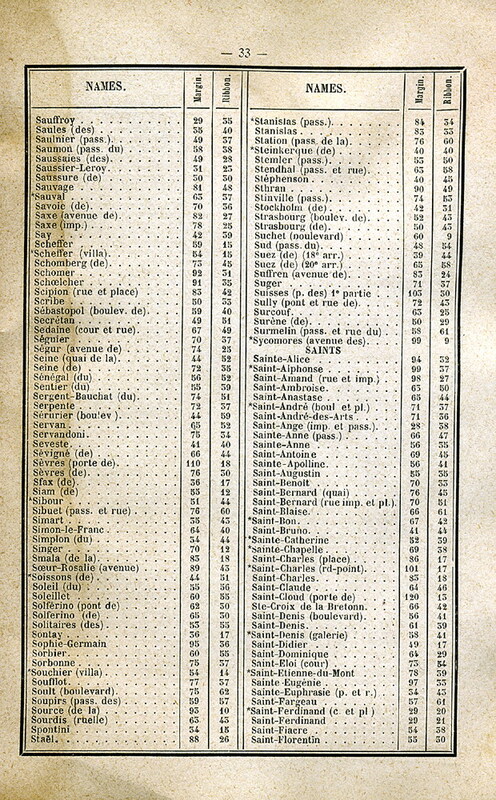 The never varying principle of the Bon Marche is to sell everything at a small profit, and of a thoroughly reliable quality. This principle, loyally observed, has obtained for them an uninterrupted and unprecedented success. 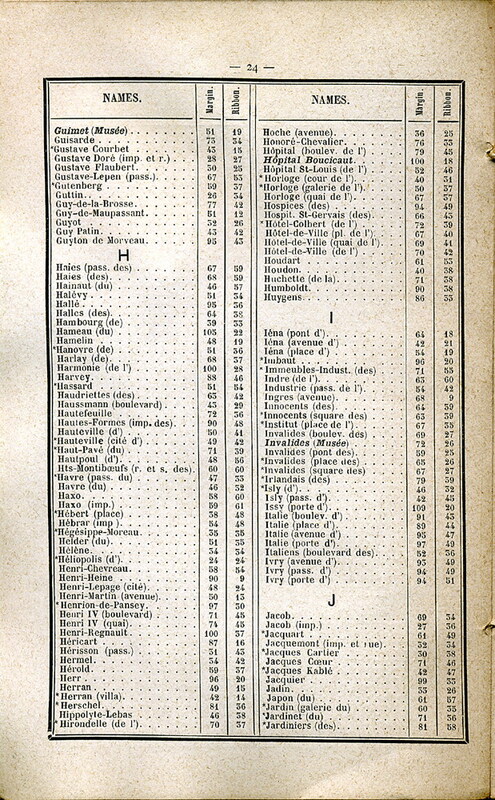 All goods are marked in plain figures and at fixed prices. The Bon Marche exchanges or refunds the value of any purchase which may have ceased to please or which does not give entire satisfaction, if not out of fashion or damaged in any particular. Interpreters for all languages are at the disposal of all foreign customers who are either desirous of making purchases or visiting the premises and their dependencies. Persons desirous of visiting the Establishment and its depen­dencies are requested to assemble in the Reading-room at 3,3op. m. A Superintendent Interpreter is specially designated to accompany the visitors through the different departments. The Picture and Sculpture Gallery was instituted by Aristide Boucicaut for the purpose of enabling artists to expose their works gratis and of allowing them to enter into relations with the numerous customers of the Bon Marche. Copies are not accepted, none but original works can be admitted. the Artist and demand neither hanging fee or payment of any kind. Ladies are requested to make known to the Heads of the Departments or to the Superintendents any inexactitude of which they may have reason to complain. 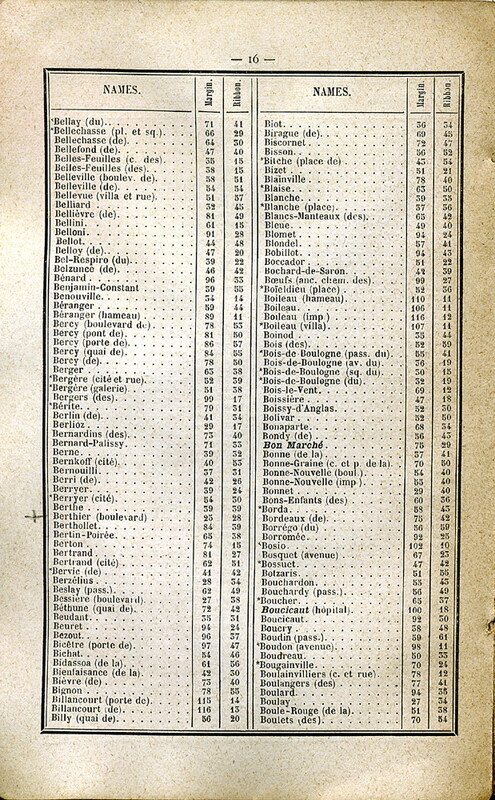 The Bon Marche make shipments to all parts of the globe and correspond in all languages. 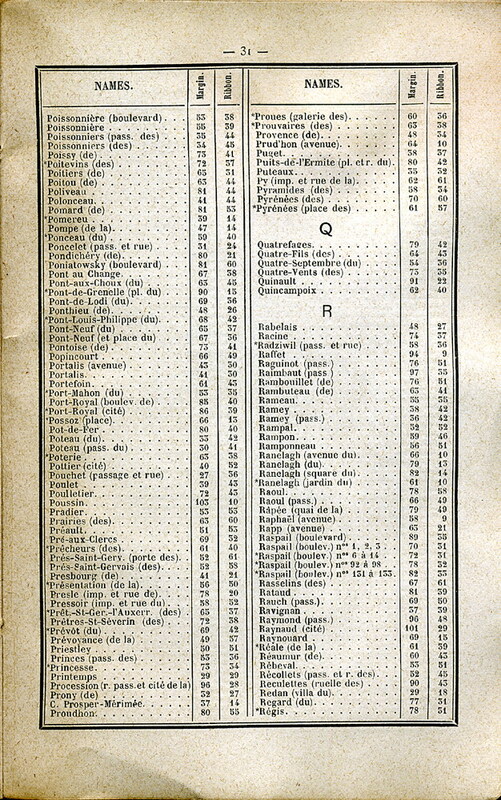 Any purchase attaining the value of 25 francs is sent, carriage paid, with the exception of furniture and other cumbrous articles, to any part of France, Great Britain, Ireland, Germany, Luxemburg, Austria, Belgium, Holland, Switzerland and Continental Italy, and payable on delivery if desired. 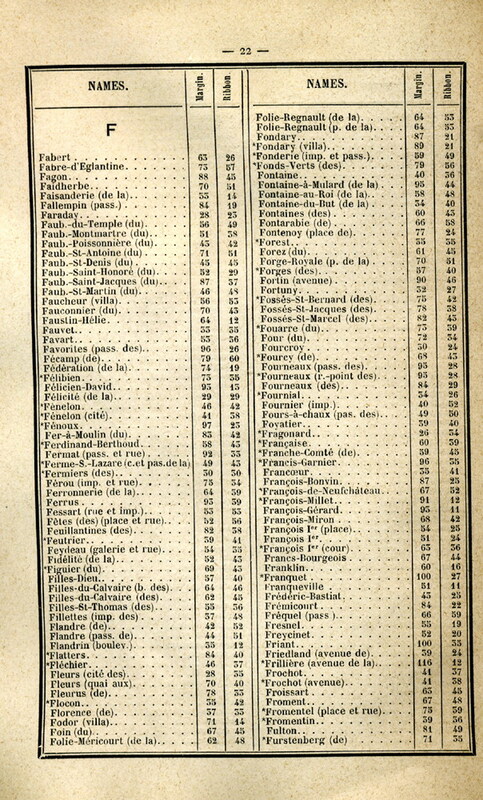 In the Reading-Room (Salon de Lecture) on the first floor, the French and leading Foreign newspapers as also writing materials are at the disposal of all visitors. of the BON MARCHE for the benefit of their employees. 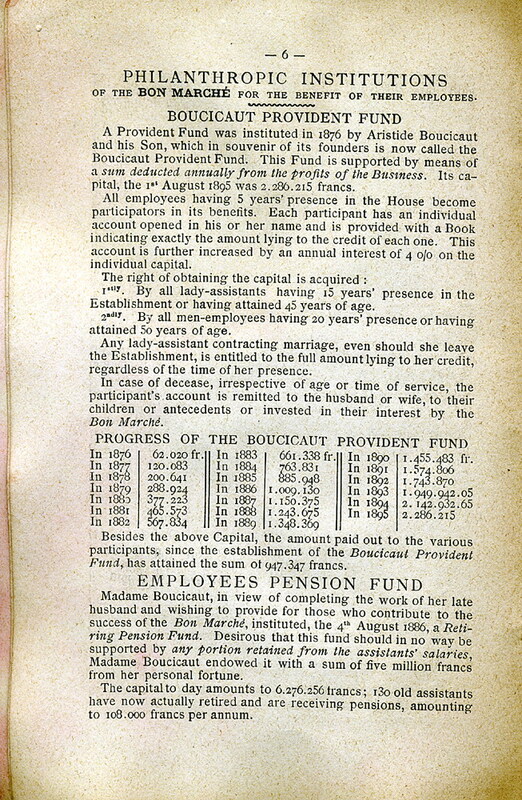 A Provident Fund was instituted in 1876 by Aristide Boucicaut and his Son, which in souvenir of its founders is now called the Boucicaut Provident Fund. This Fund is supported by means of a sum deducted annually from the profits of the Business. 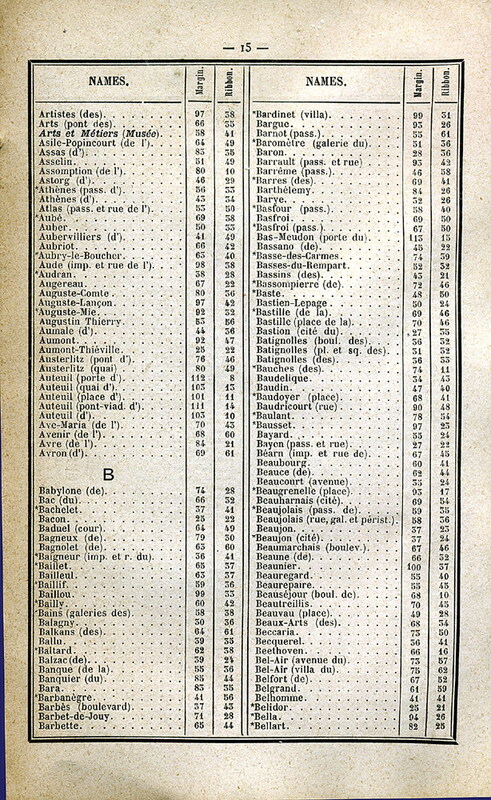 Its ca­pital, the ist August 1895 was 2.286.215 francs. All employees having 5 years' presence in the House become participators in its benefits. 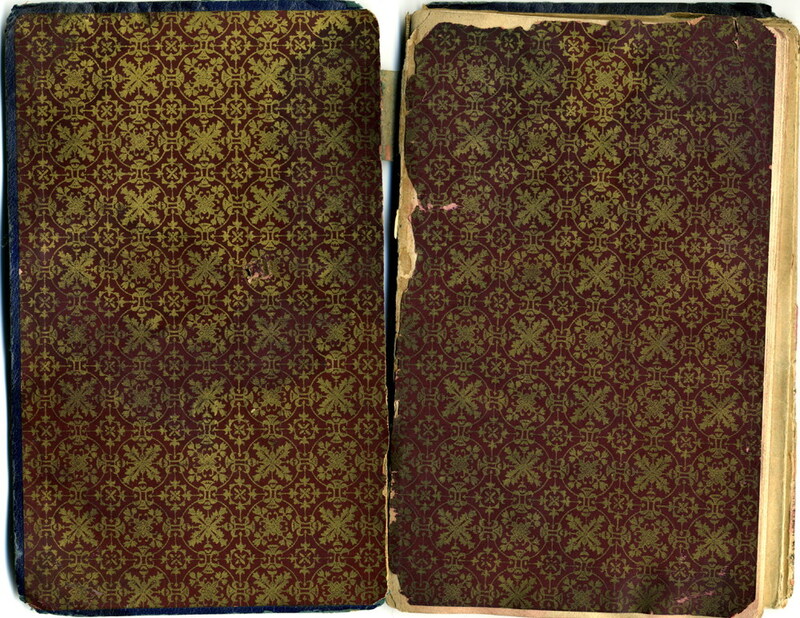 Each participant has an individual account opened in his or her name and is provided with a Book indicating exactly the amount lying to the credit of each one. This account is further increased by an annual interest of 4 o/o on the individual capital. 1stly. By all lady-assistants having 15 years' presence in the Establishment or having attained 45 years of age. 2ndly. By all men-employees having 20 years' presence or having attained 50 years of age. Any lady-assistant contracting marriage, even should she leave the Establishment, is entitled to the full amount lying to her credit, regardless of the time of her presence. In case of decease, irrespective of age or time of service, the participant's account is remitted to the husband or wife, to their children or antecedents or invested in their interest by the Bon Marche. Besides the above Capital, the amount paid out to the various participants, since the establishment of the Boucicaut Provident Fund, has attained the sum of 947.847 francs. Madame Boucicaut, in view of completing the work of her late husband and wishing to provide for those who contribute to the success of the Bon Marche, instituted, the 4th August 1886, a Retiring Pension Fund. 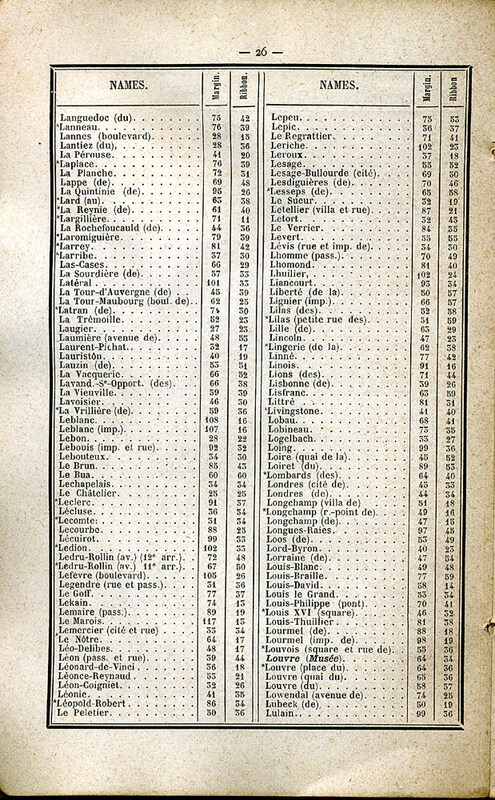 Desirous that this fund should in no way be supported by any portion retained from the assistants' salaries, Madame Boucicaut endowed it with a sum of five million francs from her personal fortune. The capital to day amounts to 6.276.256 francs; 130 old assistants have now actually retired and are receiving pensions, amounting to 108.000 francs per annum. All employees are entitled to this Pension after 20 years presence in the Establishment; it is paid to men-employees on attaining the age of 50 and to lady-employees on attaining the age of 45. It is a life pension and varies from 600 to 1,500 fr. per annum. The amount of each pension is fixed by the Committee of the Fund, at the time the employee ceases his duties. Pensions or relief can exceptionally be granted by the Com­mittee : to employees in active service who are unable to continue their duties or to their widows or orphans (under age). The Directors and Shareholders of the Bon Marche, desirous of bettering the condition of the workpeople, have founded a Relief and Pension Fund. 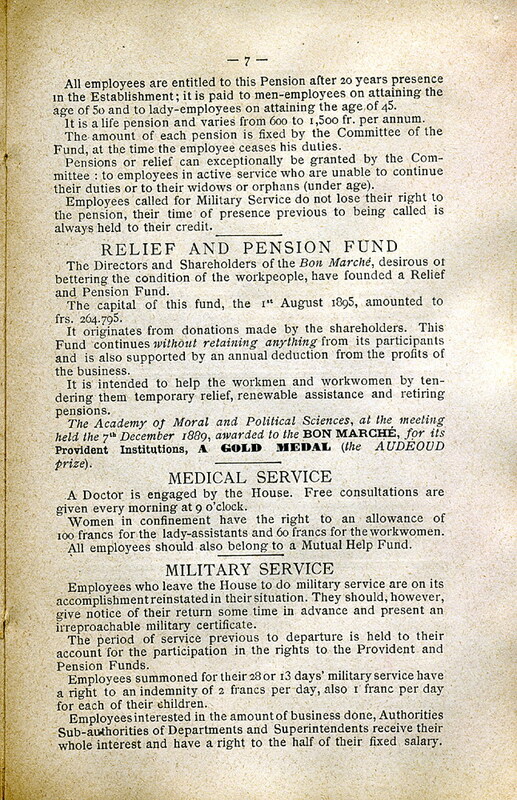 The capital of this fund, the 1st August 1895, amounted to frs. 264.795. It originates from donations made by the shareholders. This Fund continues without retaining anything from its participants and is also supported by an annual deduction from the profits of the business. It is intended to help the workmen and workwomen by ten­dering them temporary relief, renewable assistance and retiring pensions. 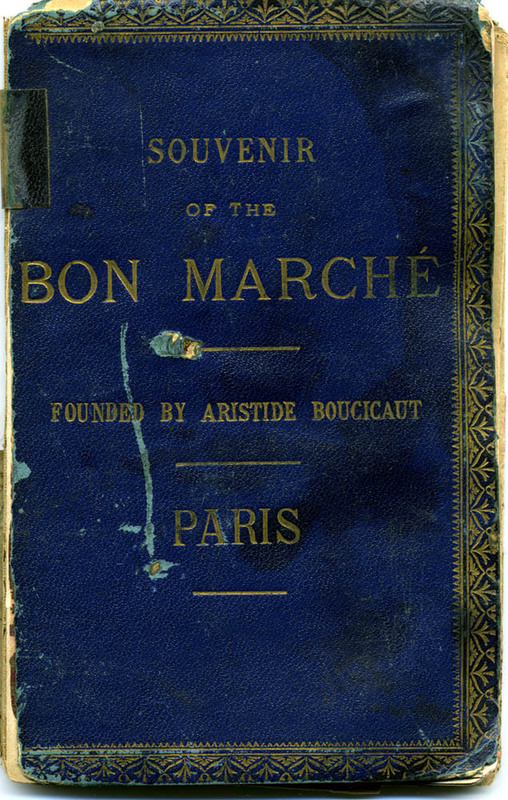 The Academy of Moral and Political Sciences, at the meeting held the 7"- December 1889, awarded to the BON MARCHE, for its Provident Institutions, A GOLD MEDAL (the AUDEOUD prize). A Doctor is engaged by the House. Free consultations are given every morning at 9 o'clock. 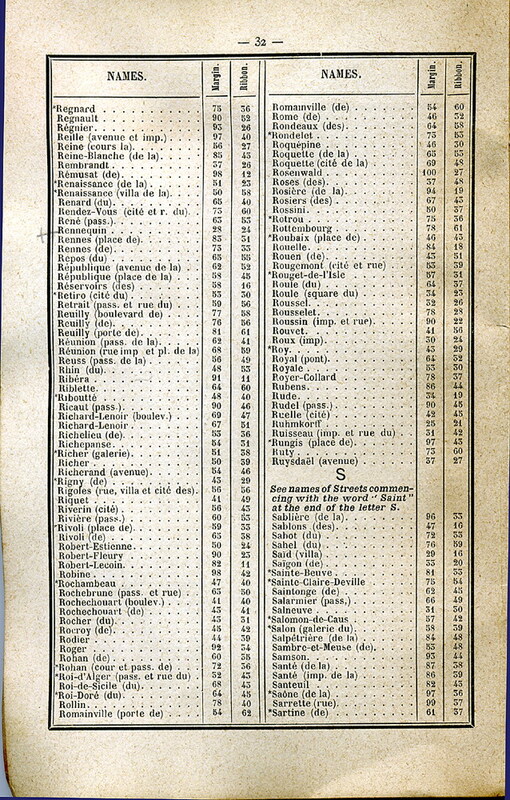 Women in confinement have the right to an allowance of 100 francs for the lady-assistants and 60 francs for the workwomen. All employees should also belong to a Mutual Help Fund. Employees who leave the House to do military service are on its accomplishment reinstated in their situation. They should, however, give notice of their return some time in advance and present an irreproachable military certificate. The period of service previous to departure is held to their account for the participation in the rights to the Provident and Pension Funds. Employees summoned for their 28or 13 days' military service have a right to an indemnity of 2 francs per day, also i franc per day for each of their children. Employees interested in the amount of business done, Authorities Sub-authorities of Departments and Superintendents receive their whole interest and have a right to the half of their fixed salary. The Bank of France issues notes ot5o, roo, 5oo, 1,000 and 5,ooo fr. 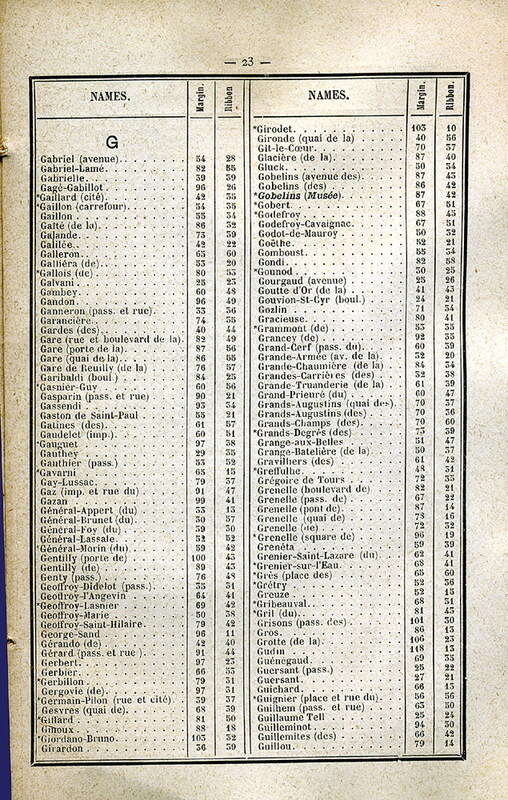 Gold pieces are of the value of 5, 10, 20, 40, 5o and 100 francs. 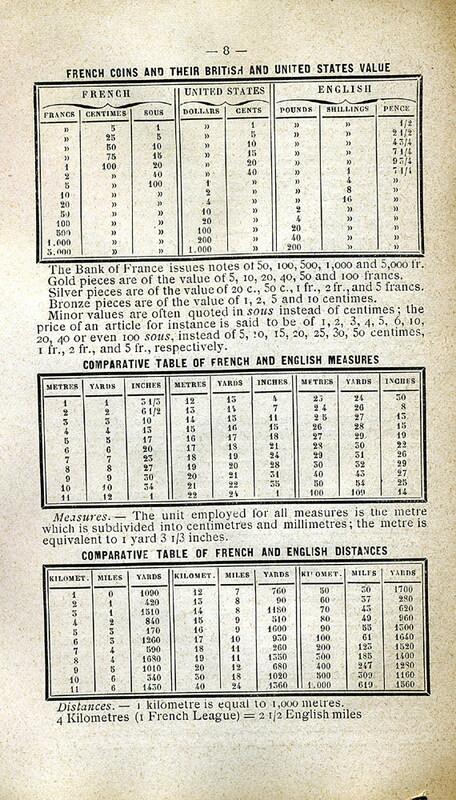 Silver pieces are of the value of 20 c., 5o c., i fr., 2 fr., and 5 francs. 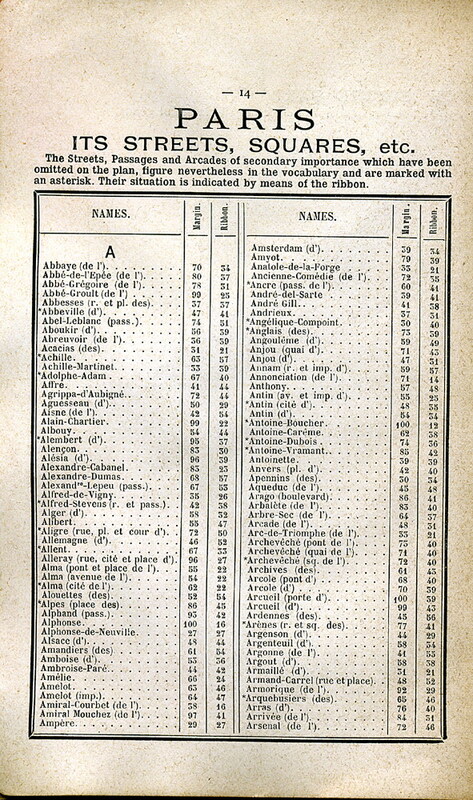 Bronze pieces are of the value of i, 2, 5 and 10 centimes. 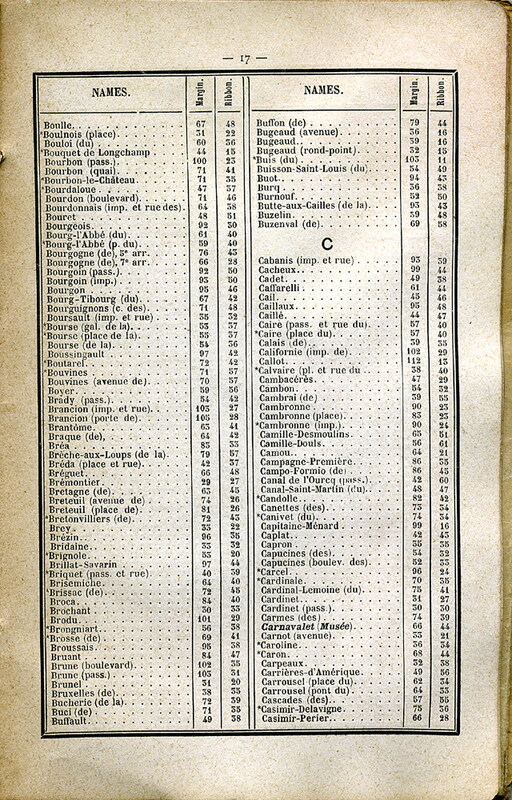 Minor values are often quoted in sous instead of centimes ; the price of an article for instance is said to be of i, 2, 3, 4, 5, 6, 10, 20, 40 or even too sous, instead of 5, :o, i5, 20, 25, 3o, 5o centimes, i fr., 2 fr., and 5 fr., respectively. Measures. — The unit employed for all pleasures is the metre which is subdivided into centimetres and millimetres; the metre is equivalent to 1 yard 3 1/3 inches. 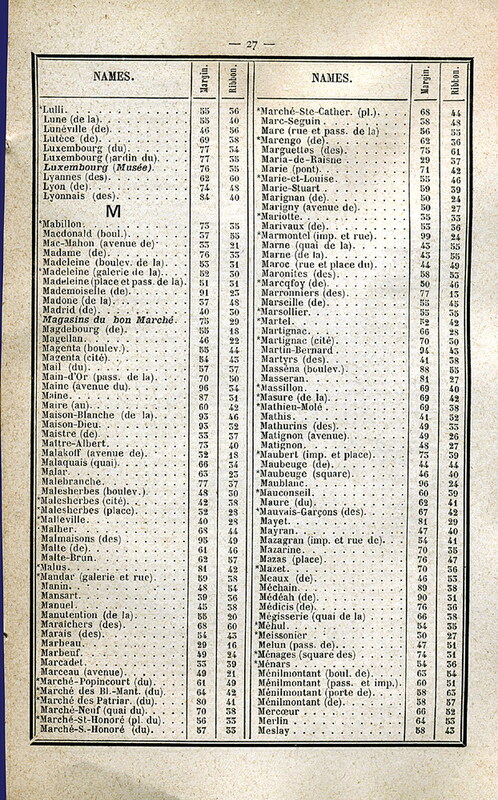 bonm009 [Image] "Silk Departments" in the Bon Marche. One of the largest cab-stands in Paris is situated quite close to the Bon Marche. On hiring a cab, ask the driver for his number (numero). This ticket will serve in case of complaint or enquiry. 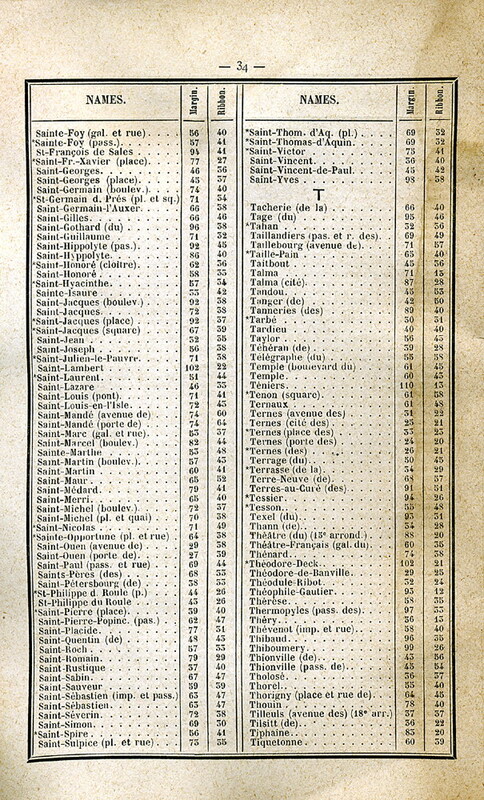 The charge in case of a cab for 2 or 4 persons returning empty from beyond the fortifications is 1 franc, and of a cab for 6 persons, 2 francs. Luggage. 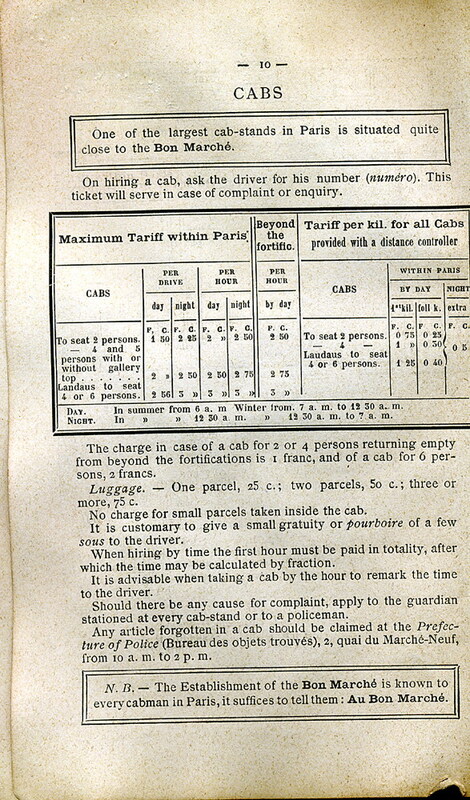 — One parcel, 25 c.; two parcels, So c.; three or more, 78 c.
No charge for small parcels taken inside the cab. It is customary to give a small gratuity or pourboire of a few sous to the driver. When hiring by time the first hour must be paid in totality, after which the time may be calculated by fraction. It is advisable when taking a cab by the hour to remark the time to the driver. Should there be any cause for complaint, apply to the guardian stationed at every cab-stand or to a policeman. Any article forgotten in a cab should be claimed at the Prefec­ture of Police (Bureau des objets trouves), 2, quai du Marche-Neuf, from 10 a. m. to 2 p. m.
N. B. 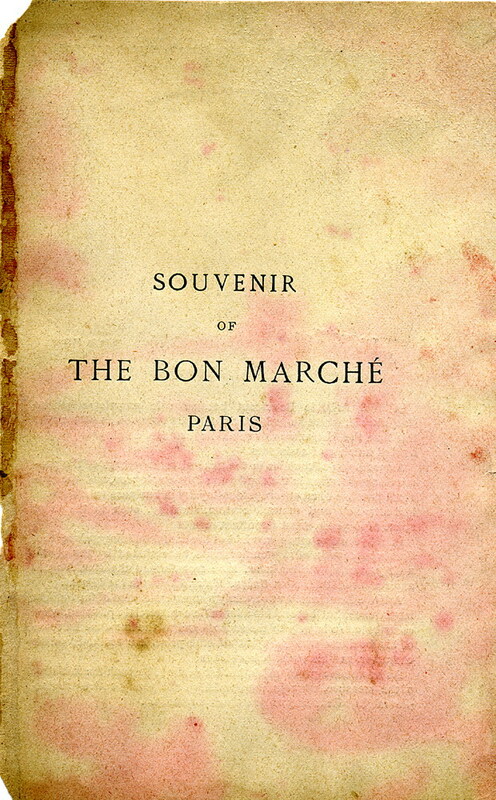 — The Establishment of the Bon Marche is known to every cabman in Paris, it suffices to tell them: Au Bon Marche. 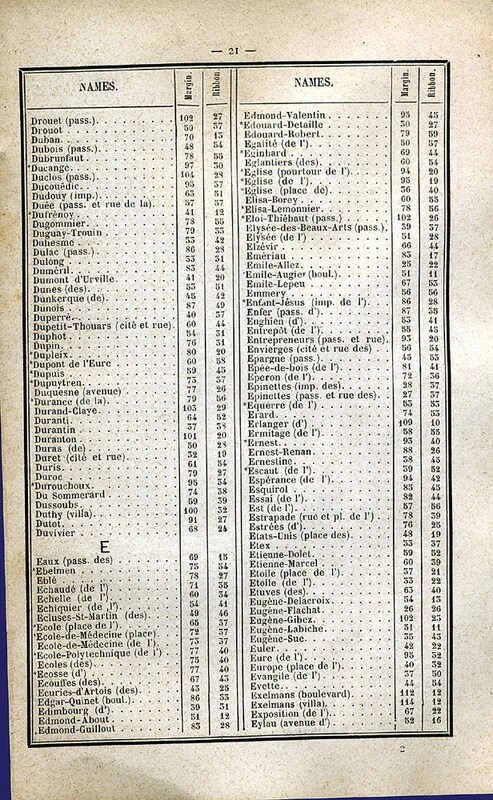 Places marked* are on the left bank of the Seine. 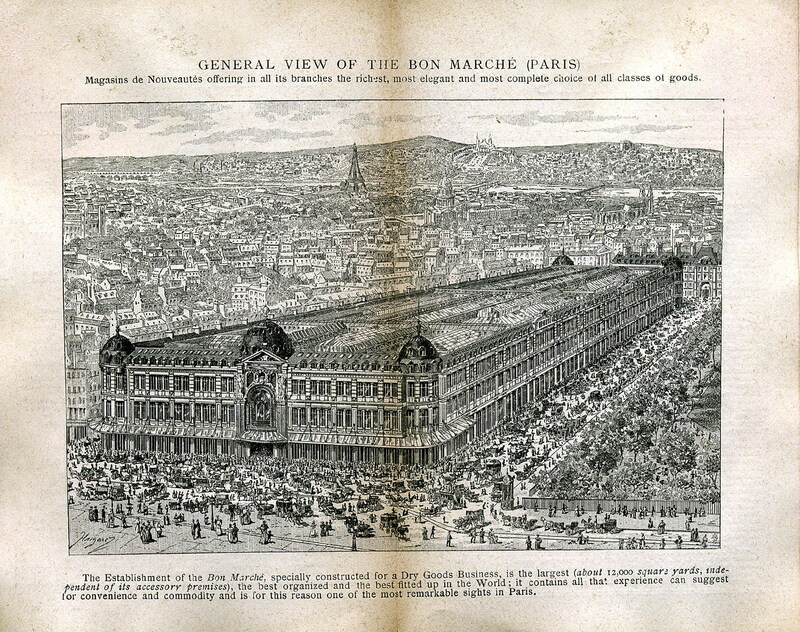 The Establishment of the Bon Marche, specially constructed for a Dry Goods Business, is the largest (about 12,000 square yards, independent of its accessory premises), the best organized and the best fitted up in the World; it contains all that experience can suggest for convenience and commodity and is for this reason one of the most remarkable sights in Paris. 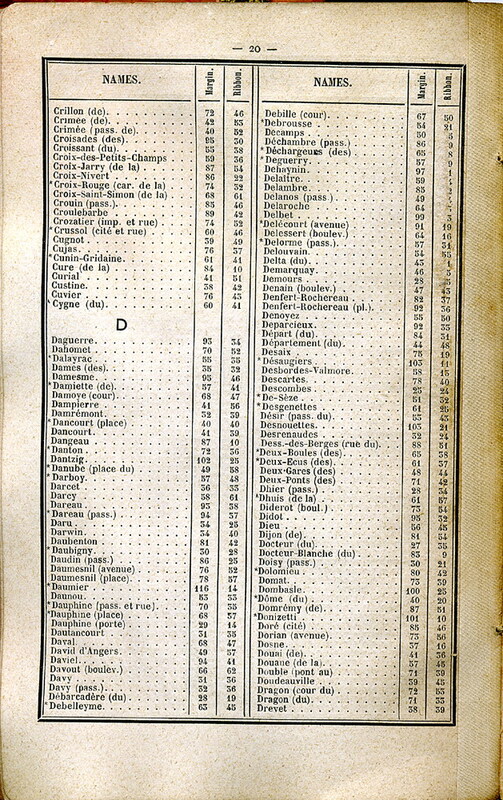 The Streets, Passages and Arcades of secondary importance which have been omitted on the plan, figure nevertheless in the vocabulary and are marked with an asterisk. Their situation is indicated by means of the ribbon. bonm015 [Table] Paris, its Streets, Squares, etc. bonm016 [Table] Paris, its Streets, Squares, etc. bonm017 [Table] Paris, its Streets, Squares, etc. bonm018 [Table] Paris, its Streets, Squares, etc. bonm019 [Table] Paris, its Streets, Squares, etc. bonm020 [Table] Paris, its Streets, Squares, etc. bonm021 [Table] Paris, its Streets, Squares, etc. bonm022 [Table] Paris, its Streets, Squares, etc. bonm023 [Table] Paris, its Streets, Squares, etc. bonm024 [Table] Paris, its Streets, Squares, etc. bonm025 [Table] Paris, its Streets, Squares, etc. bonm026 [Table] Paris, its Streets, Squares, etc. bonm027 [Table] Paris, its Streets, Squares, etc. bonm028 [Table] Paris, its Streets, Squares, etc. bonm029 [Table] Paris, its Streets, Squares, etc. bonm030 [Table] Paris, its Streets, Squares, etc. bonm031 [Table] Paris, its Streets, Squares, etc. bonm032 [Table] Paris, its Streets, Squares, etc. bonm033 [Table] Paris, its Streets, Squares, etc. bonm034 [Table] Paris, its Streets, Squares, etc. bonm035 [Table] Paris, its Streets, Squares, etc. 1stly. 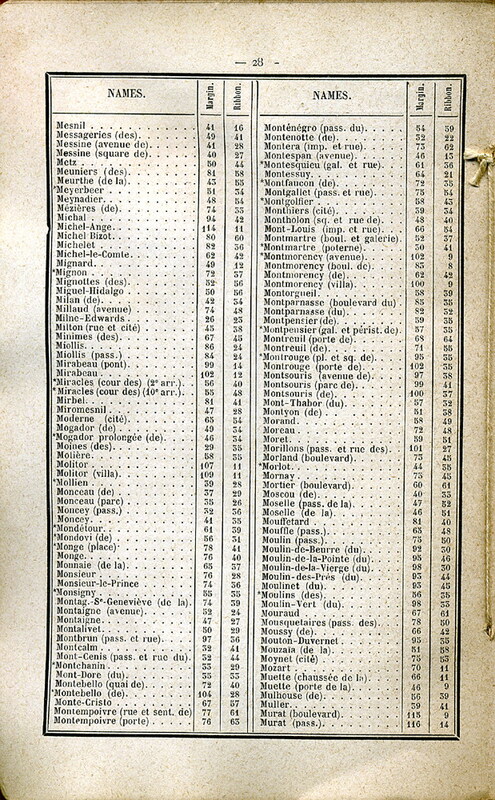 To the number marked in the margin of the map. 2ndly. To the number marked on the ribbon. 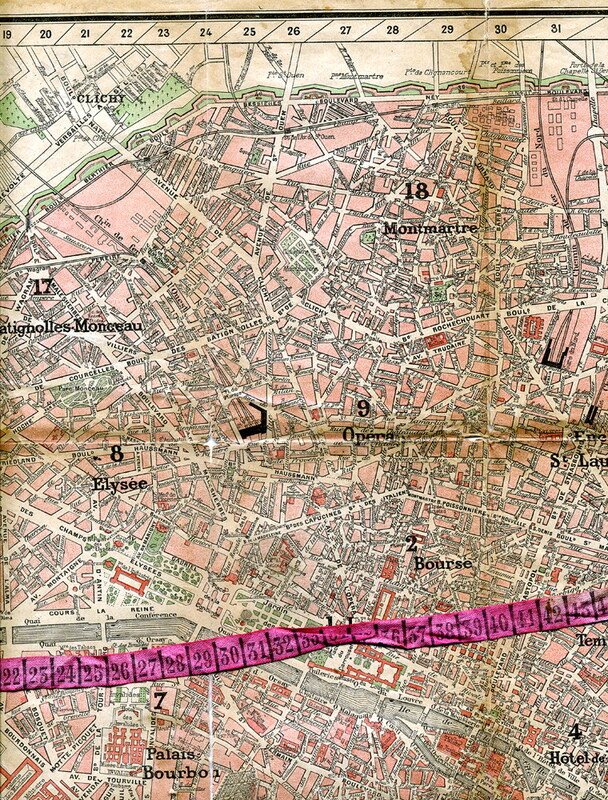 To find instantly any street, you have only to stretch the ribbon so as to cover the number in the margin. The street sought for will be found UNDER THE NUMBER ON THE RIBBON. 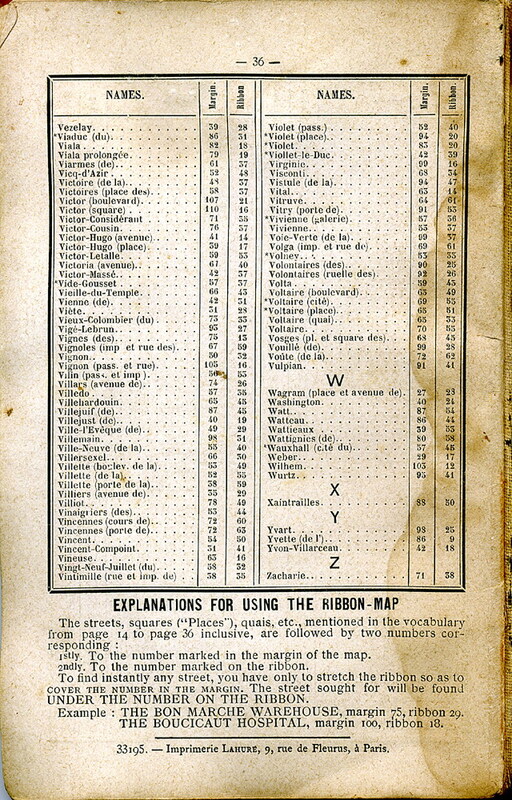 Example:THE BON MARCHE WAREHOUSE, margin 75, ribbon 20. THE BOUCICAUT HOSPITAL, margin 100, ribbon 18.33i95. — Imprimerie lahure, 9, rue de Fleurus, a Paris. 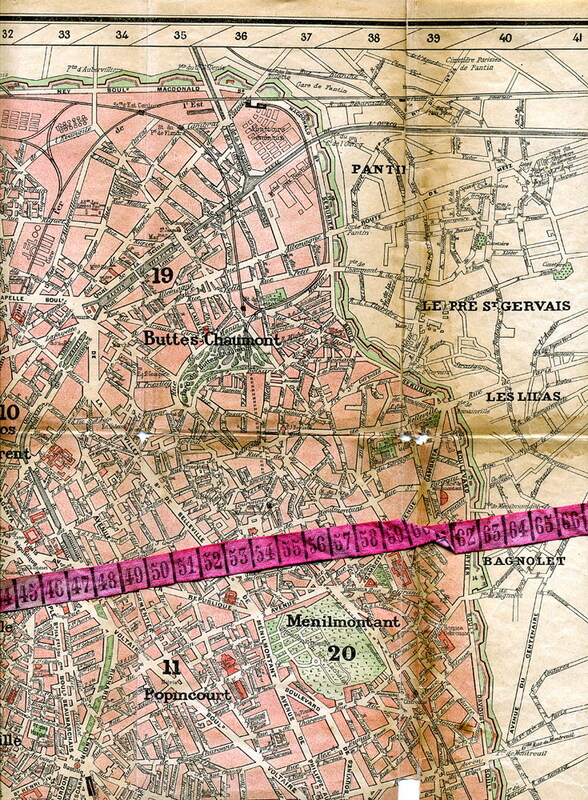 MAP bonm037 Detail of map section" "Plan de Paris de Magasins du Bon Marche Maison du Aristide Boucicaut, Paris" containing a measuring tape for locating streets and businesses in Paris. Top left. 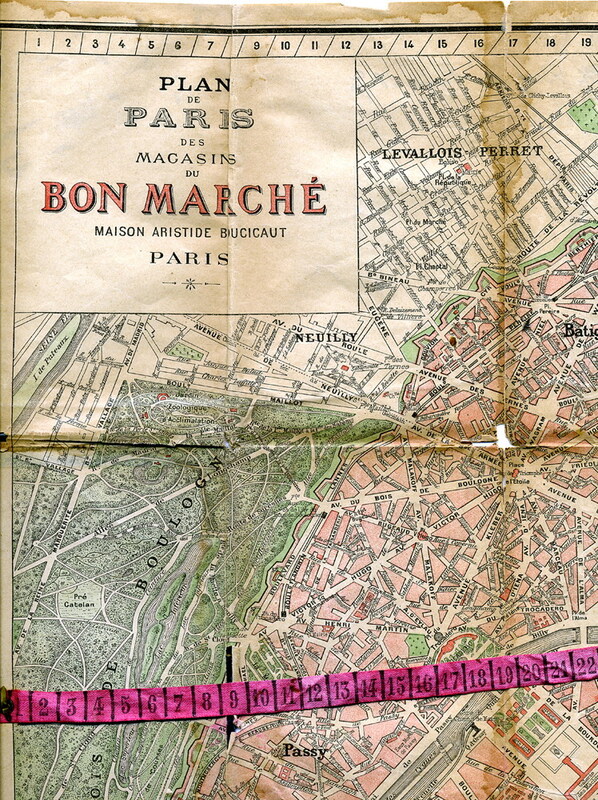 MAP bonm038 Detail of map section" "Plan de Paris de Magasins du Bon Marche Maison du Aristide Boucicaut, Paris" containing a measuring tape for locating streets and businesses in Paris. MAP bonm039 Detail of map section "Plan de Paris de Magasins du Bon Marche Maison du Aristide Boucicaut, Paris" containing a measuring tape for locating streets and businesses in Paris.